From today, smoking bans have been extended to include the entrances to most government buildings, as well as outdoor dining areas. This is all good. We’re way behind the other states on this. It’s about time non-smokers, who make up the vast majority of the population, had the right to more smoke-free places, including while eating. The changes also mean e-cigarettes are included in smoking bans. This is also welcome. Until now, as I understand it, e-cigarettes were not actually banned on and around public transport. Vapers like to claim it’s harmless. I’m not sure I believe that, but regardless, I still don’t want the fumes in my face. Until 2014, smoking was still permitted in some parts of railway stations, and around tram and bus shelters. It was only in 2007 that smoking was banned in pubs. It seems outlandish now, but as late as 2001, you could smoke in restaurants. At one office job I worked at in 1998, people still smoked in the courtyard entrance, and I was told it had only been a couple of years earlier that smoking had been banned inside the office. To coin a phrase, smokers are a dying breed. In 2015 it was down to 11.9% of Victorians, and hopefully it’ll continue to drop as it’s banned in more places. 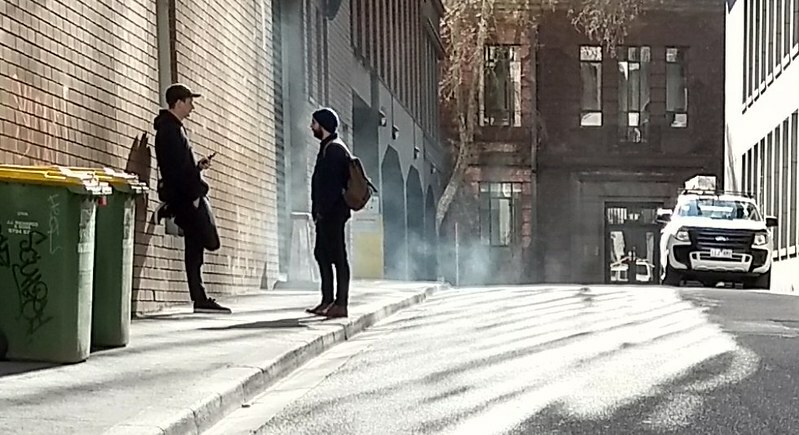 Smoke blows around easily, and sometimes it’s difficult to walk along city streets without breathing it in. So I hope the bans will continue to spread. It’s good to see progress. Adults may have the right to smoke, but increasingly they can’t inflict it on others. And that’s a good thing. I’ve never been one for organised sport, but I’ve had a few failed attempts at an exercise regime over the years. In the late 90s, I would regularly go for a short morning run, but I kind of fell out of the habit after a few months. A couple of years ago I got a punching bag, but it hasn’t really stuck. I do get a fair bit of walking in. But I was looking for something a little more intensive, specifically to lose belly fat, which over the Christmas period can be an issue, but which to be honest I’ve been picking up over the past few years. Googling around I found this page, which may or may not be reputable: WikiHow: How to Lose Belly Fat. Brisk walk or jog down to the local oval. Do laps: run for 60 paces (which is about 20 seconds), then walk until ready to run again. Repeat for at least 5 laps, which takes about 13-15 minutes. I’m trying to steadily increase this, but 5 is a good starting point. If you’ve done 1-2, you’ve barely started and can’t give up. If you’ve done 3-4 you’re nearly finished, and can’t give up. I figure it’s all about getting the heart pumping, which it certainly does. After the laps, a brisk walk or jog back to home. I’ve been doing this three times a week (Thursday night, Saturday morning, Sunday night — these are the easiest times at present), but more often in the past few weeks as I’ve had a bit of leave from work. 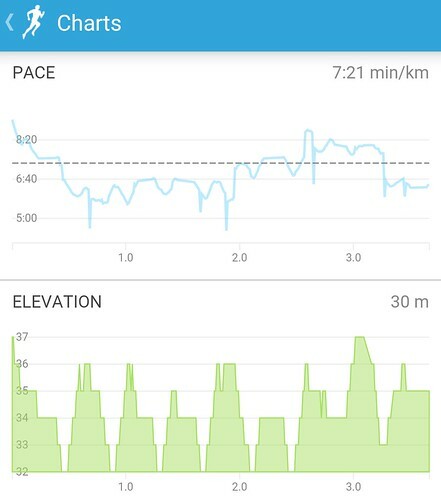 RunKeeper is tracking my progress (hence the graphs above), and nagging me if I go more than three days between runs. If I get a stitch, I gather there are ways to combat that, by taking care with what/when you eat, and warming up properly. I’ve tried running with music, but I need to get earphones that don’t fall out… and the music means I can’t count the steps/laps properly. It would work by going at a slower, more consistent pace that doesn’t need counting. 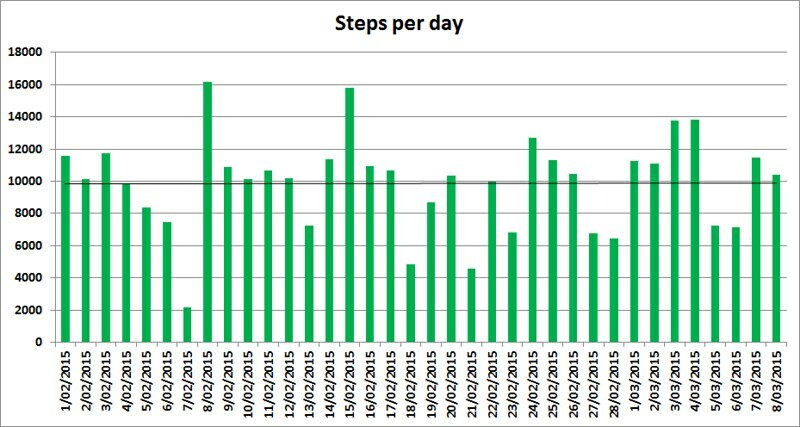 Is the running having an effect? I hope so, but it’s a little hard to tell. Belly still round, but the “grab test” seems to be a little harder, so the signs are good. I’ll try and keep at it. 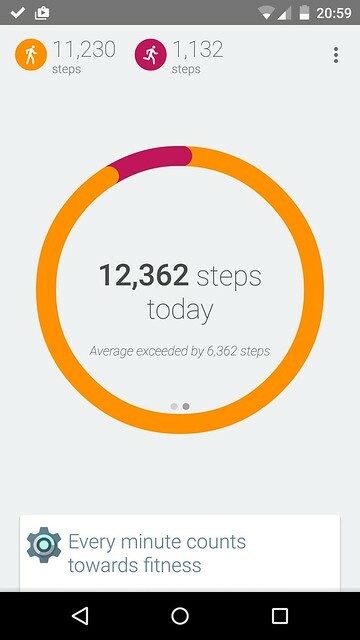 Who else is running, or has a different exercise regime?